Living on a property in the subtropics where I rely totally on rainwater and natural rainfall for watering, I love growing vegetables and at times have been virtually self sufficient, as well as giving excess to friends. However, I am often in full production over the summer and autumn months when it is hot, wet and humid and this is not the time to grow traditional northern European crops. I am often busy on weekends and vegetables that don’t require constant maintenance are therefore the backbone of my vegetable garden and I suspect these plants are the ones that many other time-poor gardeners would find most reliable. Interestingly most of them were the staple plants grown in my area decades ago, when gardeners relied on their own produce and grew plants that were suited to the local climate. A few months after moving to my current property, and before I started to do much in the garden, a cherry tomato plant appeared in the rocky subsoil on a barren dam wall. Within a month or so it was covered in fruit – very large and delicious fruit. As much as I picked them, the more tomatoes the plant produced. 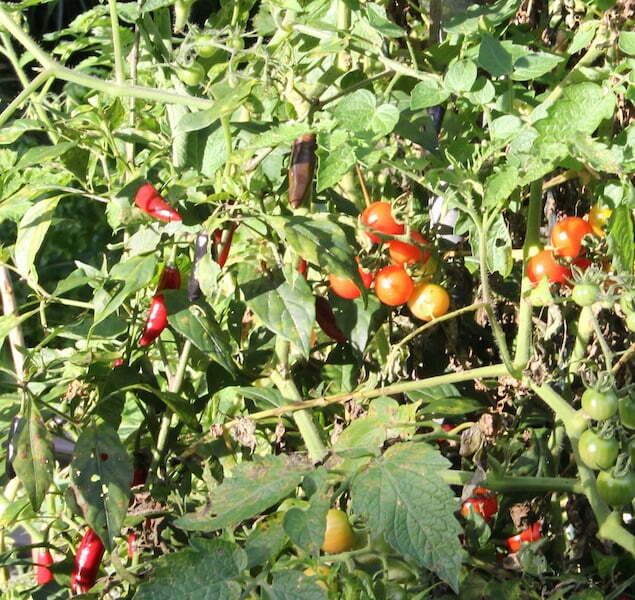 First they were used in salads, then in sauces and finally in delicious tomato soups. 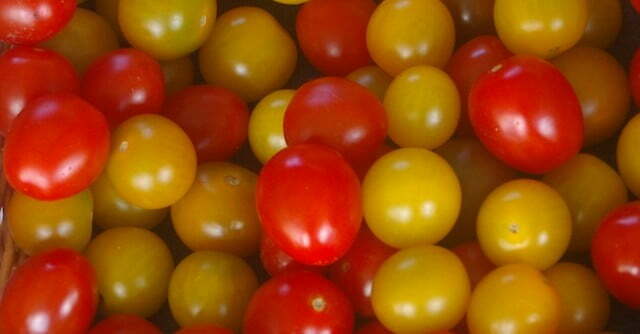 Cherry tomatoes lend a distinctive and delicious flavour to cooked dishes. I love the way they burst in your mouth – little bombs of flavour. Today this same area where the cherry tomato appeared is mulched and the soil is now a rich brown, due to cultivation and the addition of large quantities of organic matter. Whilst I continue to remove tomato seedlings among the groundcovers at the front of the garden, there is always room for a few tomatoes to grow between the establishing shrubs. These plants have continued to grow and fruit copiously despite the 7 months of drought we have recently endured. 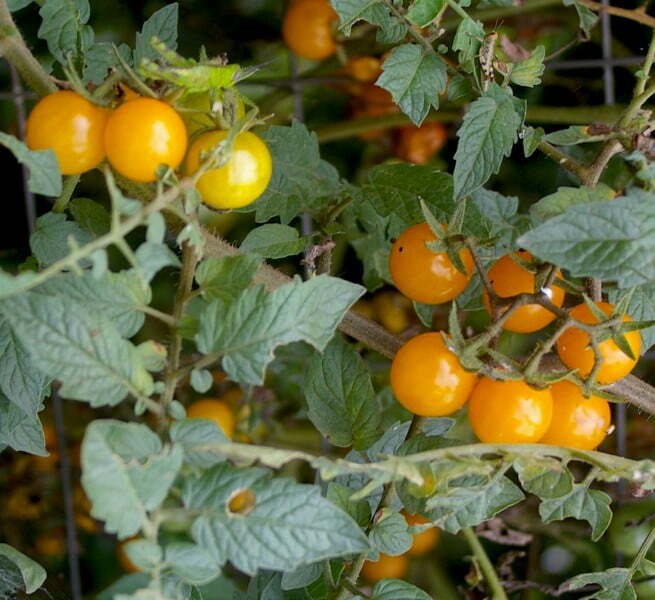 Cherry tomatoes are a very different breed to the prima donna tomatoes with the larger fruit. They are vigorous, and generally disease and pest free. This includes the ubiquitous fruit fly, which dislikes the thicker skins of this tomato. They also come in a wide variety of colours and flavours. 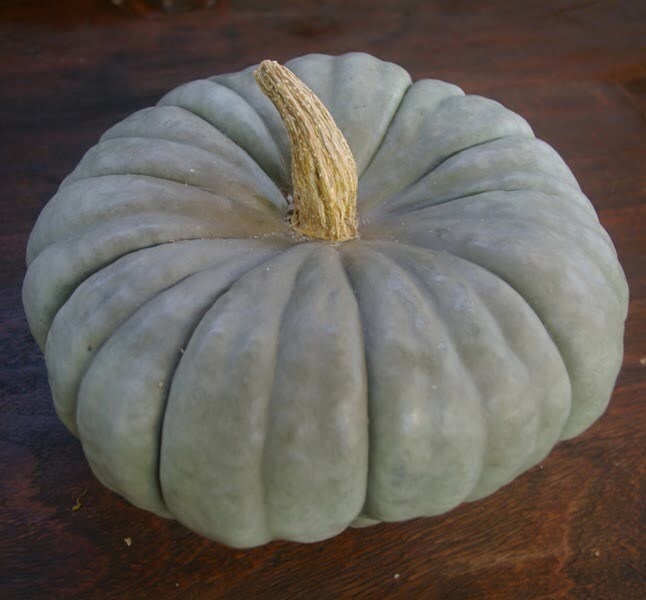 I’m a fan of blue pumpkins such as ‘Queensland Blue’, ‘Triamble’ and ‘Oxheart’. I prefer the flavour and consistency of these pumpkins in savory dishes and soups. However blue pumpkins are less widely available these days as many cooks find the hard skin difficult to slice and the pumpkins too big for the dishes they intend to make. Sadly these big blue pumpkins are disappearing from the grocer’s or supermarket shelves and our gardens and being replaced with the increasingly popular “Jap” pumpkin (more correctly ‘Kent’). As much as I resent the lack of diversity in pumpkins and the dominance of the “Jap” pumpkin in our lives, I have a newfound respect for this cultivar. A seedling appeared of its own volition at the edge of a garden bed a couple of years ago. I suspect it came up as the result of incorporating some home made compost. Before I got round to removing the seedling, it was off and away and young pumpkins were visible. By the end of the season the plant had produced over 80 pumpkins. Friends often went home with them. The only maintenance involved was directing the growth of the plant over the lawn rather than over adjacent groundcover plants in the garden bed. I finally cut the plant back last August, after removing the last fruit. However by October this same plant was back again, and before I had a chance to remove it, the first fruit were almost ready to pick. I still have half a dozen fruit from last year. They are still in good condition but lack the flavour and sweetness of the fresh fruit. I can see why pumpkins were such a mainstay in the early pioneer gardens. They are hardy, prodigious producers and provide a year round crop which is readily stored. The local wildlife don’t seem to like them either. They will give the odd pumpkin a peck or bite, but this is it. Whilst the “Jap” may be a super star when it comes to production, all pumpkins grow well in the subtropics. They are generally sown in August or September in beds well dug with large quantities of compost and a good handful of fertiliser. Keep the young seedlings well watered and once they are away, remove all but the most vigorous of plants. Give these plants plenty of room to spread as they can readily cover 3 to 5 metres of ground. An old trick is to keep turning the runners back into the centre of the plant to limit them spreading too far. If you lack space, try some of the compact cultivars such as ‘Golden Nugget’. Keep the plants well fed and watered during the growing season and stand back! The Poor Man’s been was widely grown in northern Australia last century, particularly in rural areas. This heirloom bean was a reliable ‘stand by’ and is grown on farms in my area to this day. Poor Man’s Bean enjoys a tall frame or teepee upon which to climb. The beans are broad and fleshy, and produced in large quantities. Pick them young and daily to encourage continued production. 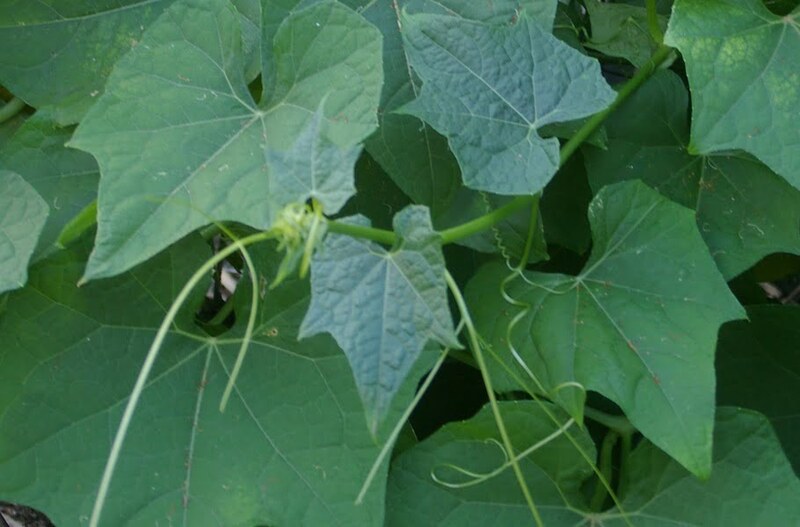 Unlike the more common green bean, this plant is a lot more drought, pest and disease tolerant. It will also tolerate slightly saline water or soils. 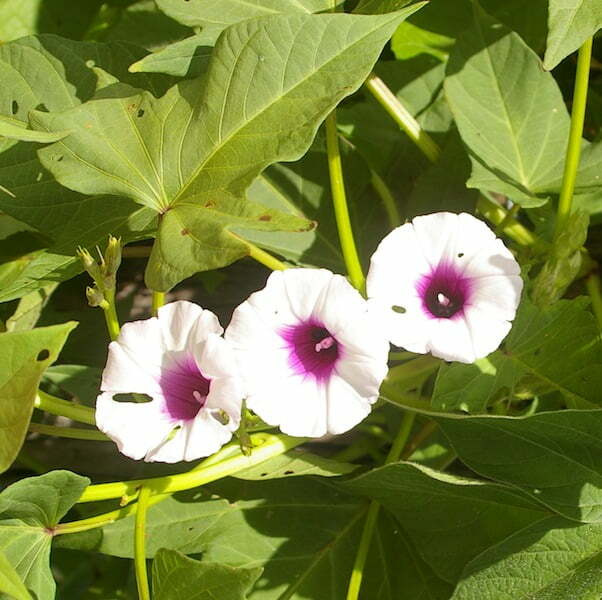 A short-lived perennial plant, it will continues to produce beans for 2 to 3 years. However the best production is in the first year. This attractive plant also has edible young leaves and edible sweetpea-like flowers. I have used the leaves in both salads and cooked dishes. The flowers make an attractive garnish. The beans have a stronger ‘beany’ flavour than the more popular green or French beans we know and love. They are particularly well suited to curries, stir fries and stews, where the flavour and texture can complement and stand up to other strong flavours. Beware, Lablab beans include many different and distinct cultivars. Some have fleshy, flavoursome, edible, young pods whilst others are used as agricultural fodder crops and are quite inedible. Don’t buy the wrong seeds. Seeds of the Poor Man’s Bean are not readily available commercially, but are often grown by senior gardeners or in rural areas. They are often available at organic gardening clubs or events. I escaped the culinary horrors of mid-century Australian vegetable cookery. However I have tried some of the choko recipes from this era. They are simply appalling. No wonder many people cannot stomach the thought of eating this vegetable. Don’t blame the vegetable – blame the cook! The choko may not be a ‘Diva’ vegetable, but it is certainly a talented member of the supporting cast in any dish. Just like zucchini, squashes or eggplant, it absorbs flavours and provides a crisp texture to a dish. Look out – here comes the choko vine…..
Whilst native to Mexico, I have had delicious dishes utilising this vegetable in South East Asia, France and Italy, where chefs have recognized its great potential. More recently many of our well-known cooks have used their skills to showcase this wonderful vegetable. The choko’s vigor and ease of growth is legendary. More infamous still is its productivity. Flower initiation and then fruit production are triggered by declining daylight hours. This leads to a feast or famine scenario. Start picking early. Sweet, young, walnut sized fruit are delicious picked straight from the plant, added to salads or lightly cooked in hor d’oevres. Half grown fruit are much more tender than the fully formed fruit sold in the supermarkets and lack the central seed. Everything about the choko is edible. The young shoots ,which are a popular green vegetable, and the root of younger plants is also widely eaten. Plants appreciate organically enriched, moisture retentive soils and a large and solid climbing support. 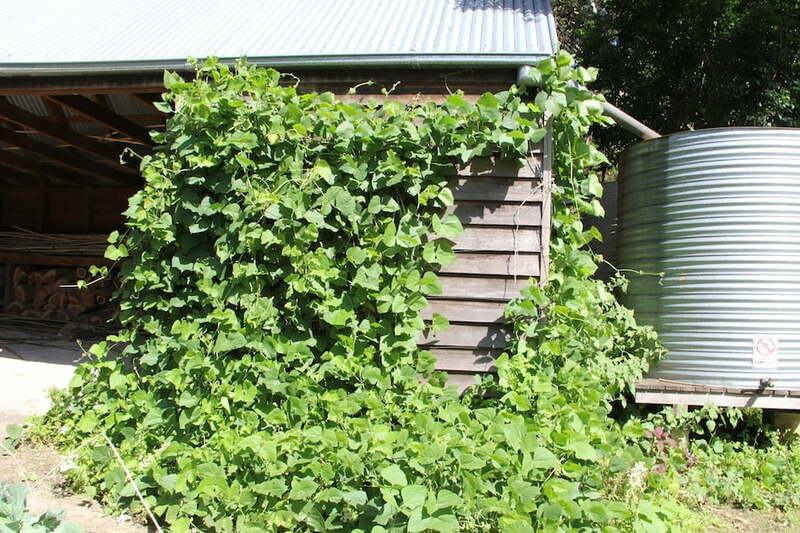 A water tank, shed or outdoor “dunny” make great supports and will soon be completely covered. While there are many different cultivars of choko, a large green cultivar is most widely grown. I grow the white choko, a cultivar that is seldom seen these days. The fruit are a luminous white and less slimy than the popular green variety. The fruit look stunning on the vine and an added bonus is you can find them at twilight or by torchlight if you need to locate some vegetables late in the evening. Most of the Brassicas we grow (cabbages, cauliflowers, broccoli, kale and Brussels sprouts) originate in the cool, moist climates of northern Europe. Whilst they may grow well in the cooler subtropical winter, they quickly bolt to flower as the temperature rises. The ancient cabbages from North and Central Africa are a different breed and happily grow through the hottest, wettest and humid summers. They form large open heads of delicious sweet flavourful leaves. Like any of the leafy Brassicas, these plants appreciate deep well-worked, highly fertile moist soils and regular applications of fertiliser. They quickly grow into large leafy rosettes, which are very attractive in the summer garden. This is the cabbage that provides an authentic flavour to an African dish. However it is also a great substitute for cabbage or kale over the summer months. Sweet potatoes thrive in our subtropical climate. They soon form a dense leafy groundcover. Plants can be propagated from cuttings or from sprouted tubers. They are best planted out as the weather starts to warm in spring. Sometimes the issue is how to control growth on these plants. Many gardeners trim them back over the growing season to keep plants compact and use the shoots as a green vegetable or as propagation material for further crops. Another problem is finding tubers at harvest time. Gardeners often place small sticks or stakes next to the newly planted cuttings to mark the spot. 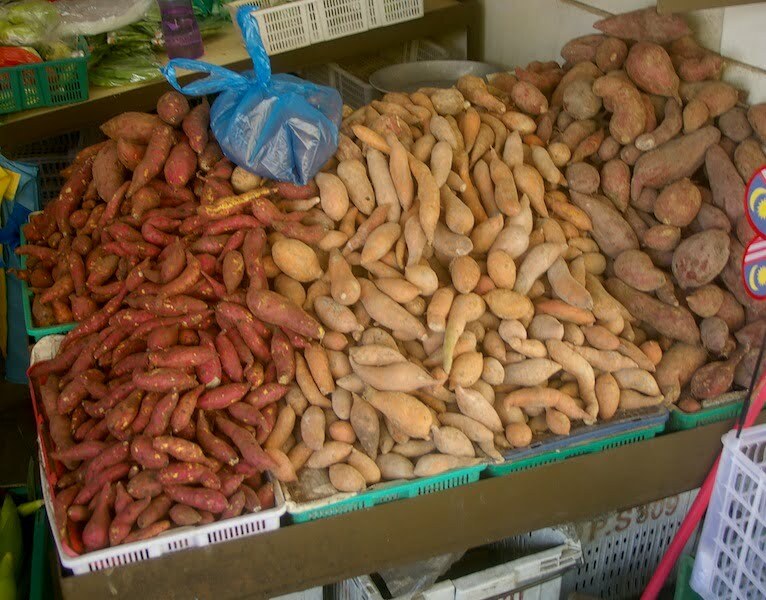 There are numerous cultivars of sweet potato being grown in Australia, with variously sized, shaped, coloured and flavoured tubers. Currently the popular orange ‘Beauregard’ is most widely available. This intrigues many overseas visitors as these orange cultivars are generally used for sweet rather than savoury dishes overseas. Like potatoes, the varied sweet potato cultivars are often suited to specific dishes. The main enemy of the sweet potato is the bush turkey. They will destroy a crop overnight. 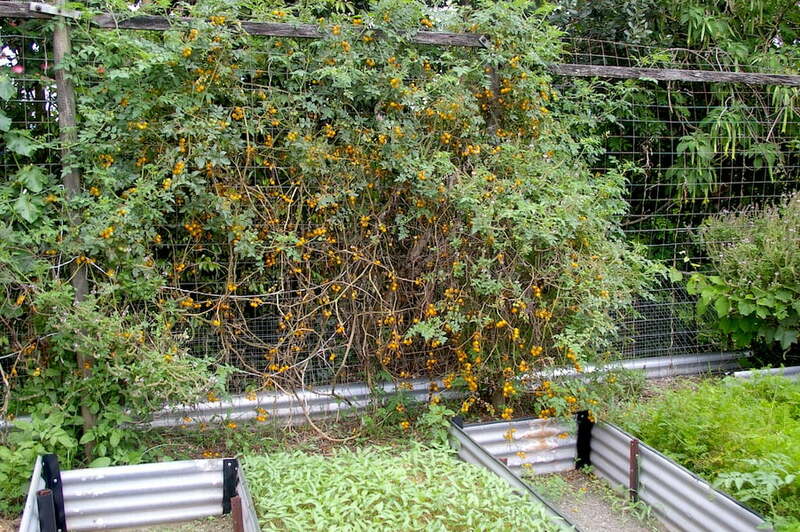 Many people plant their cuttings under pegged chicken wire to protect the juicy tubers. Sweet potato weevil can also be a problem in some areas. 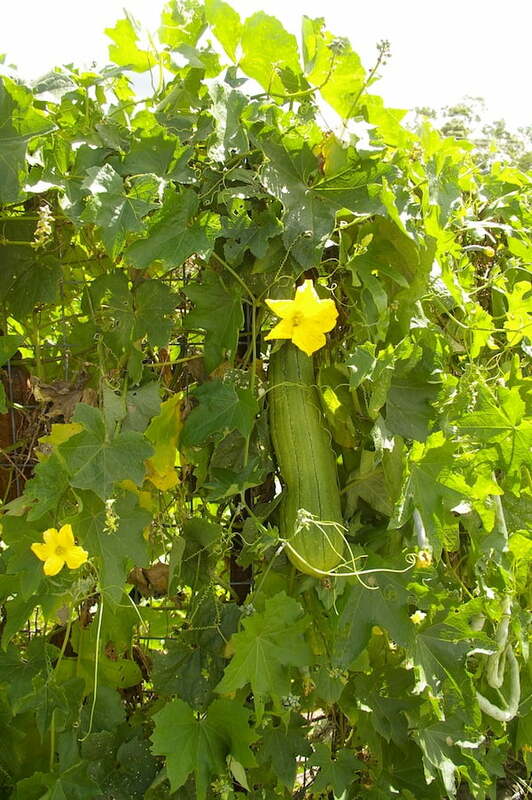 The luffa plant is a vigorous vine well suited to training over a pergola or large trellis. 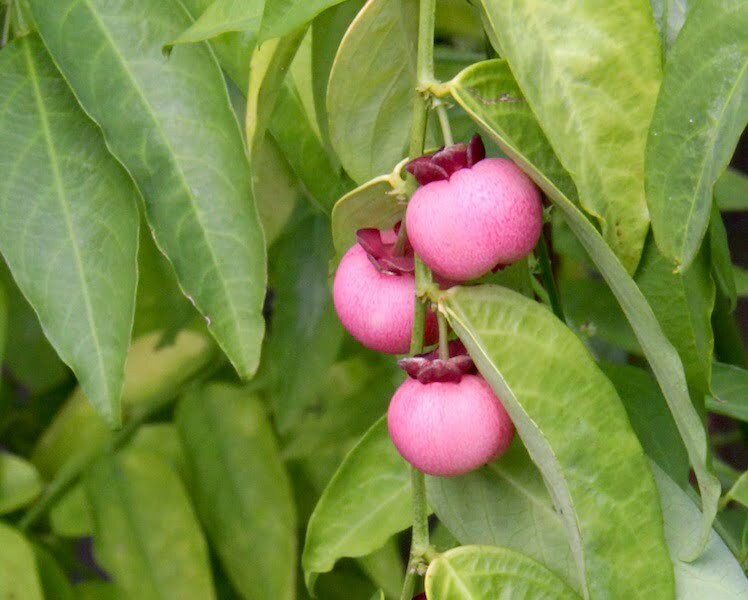 This highly productive plant can look quite ornamental when covered with hanging fruit. The fruit can be used in a diversity of dishes, as a substitute for zuchini. The fruit is a little moister than a zucchini and has a distinctive but attractive flavour. 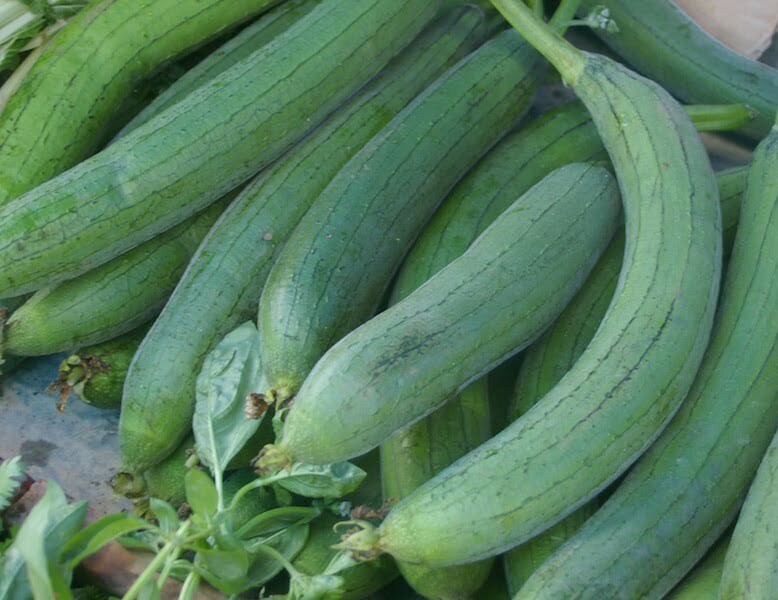 Luffa plants are certainly a lot easier to grow than zucchinis and suffer from few, if any, pests or diseases. 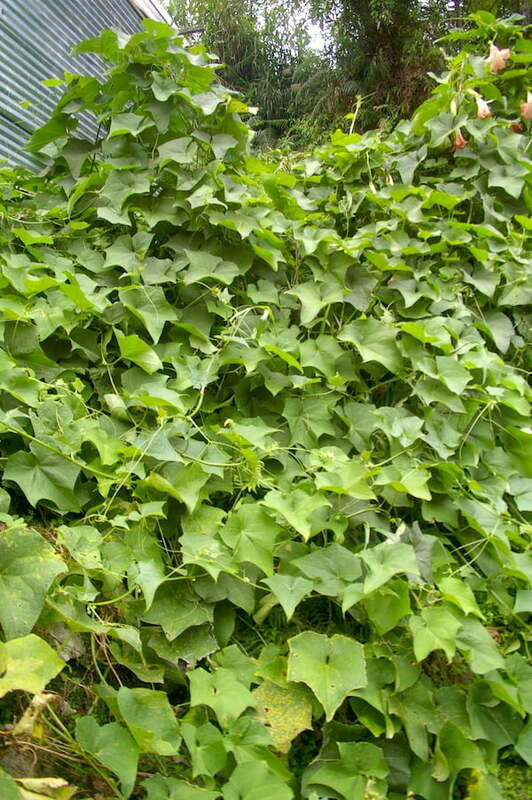 Being a large vine they are less sensitive to periods of dry weather or heat. However like all vegetables, you will be rewarded for additional watering and feeding by the increased production of these delicious fruit. If you can’t keep up with all the fruit on the vine, leave them mature and you will produce your own bathroom sponges. Wash of the flesh from a mature fruit and this is what you are left with. My favorite vegetable, with the most delicious ‘greens’ you can ever eat, grows on an ornamental shrub. The leaves are true to their name and have a delicious nutty flavour which many people compare to peas. 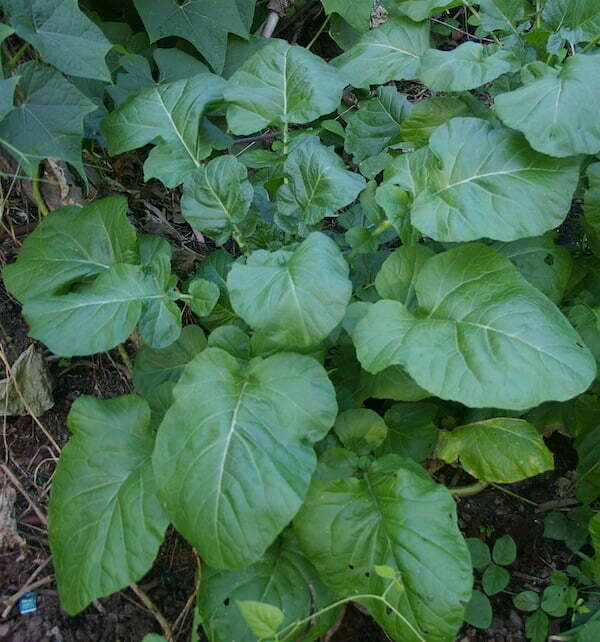 The leaves can be eaten from the bush, added to salads, or lightly cooked in a dish. The plant naturally grows as an attractive, open, willowy shrub 2 to 3 metres tall by 2 to 2.5 metres wide. However it is generally pruned as a more compact shrub to 600 to 1 metre wide by 1 to 2 metres high. Plants grow best where they receive morning sun and some protection for harsh afternoon sun. They will also grow well in semi shade or where there is shade for part of the day, which makes them ideal for many urban gardens. Plants prosper in deep organically enriched soils with regular applications of fertilizer. They appreciate additional watering during dry periods to maintain vigorous growth. You can’t have too much spinach over summer. This plant will surely deliver all the greens you can eat. 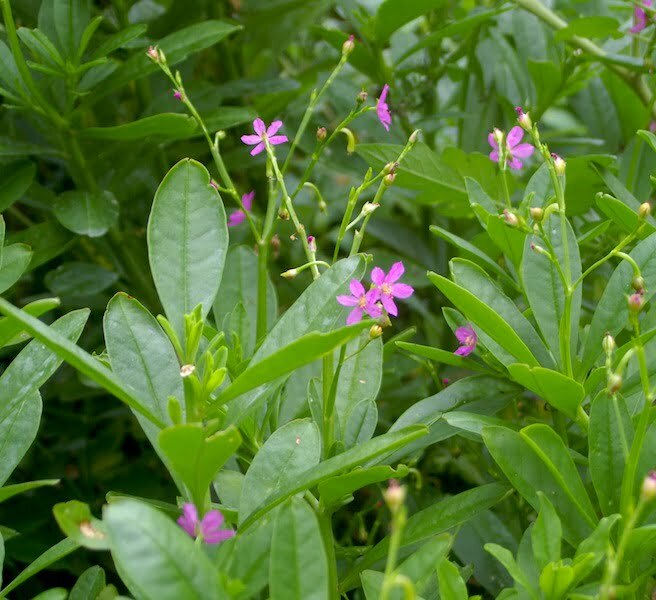 It is also very ornamental, forming a small bush of fleshy deep green leaves topped with attractive pink flowers….. An ideal plant for an ornamental potager garden. Being a succulent plant, it will survive through dry periods and then shoot back into vigorous growth as the warmth and moisture returns over summer. 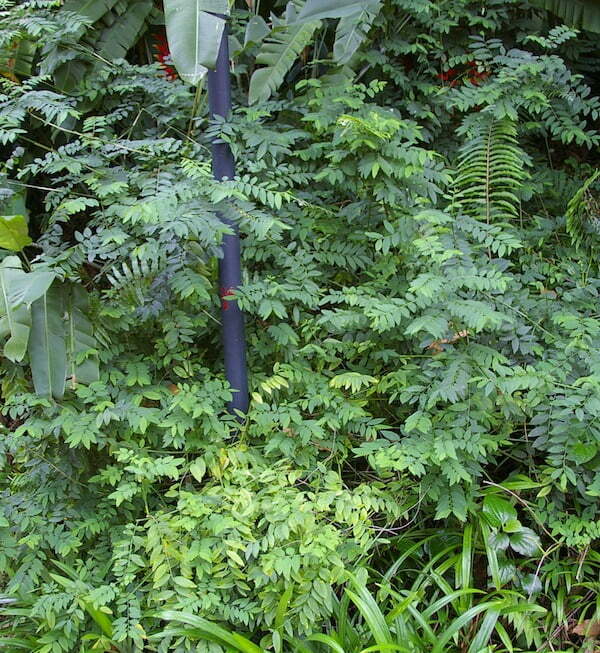 It will also grow well in semi-shade or areas shaded for part of the day. Leaves should be only lightly cooked and added as the last ingredient to the dish. Many people eat both the leaves and flowers raw, however they do contain oxalic acid, so eating large quantities of the raw leaves is not recommended. 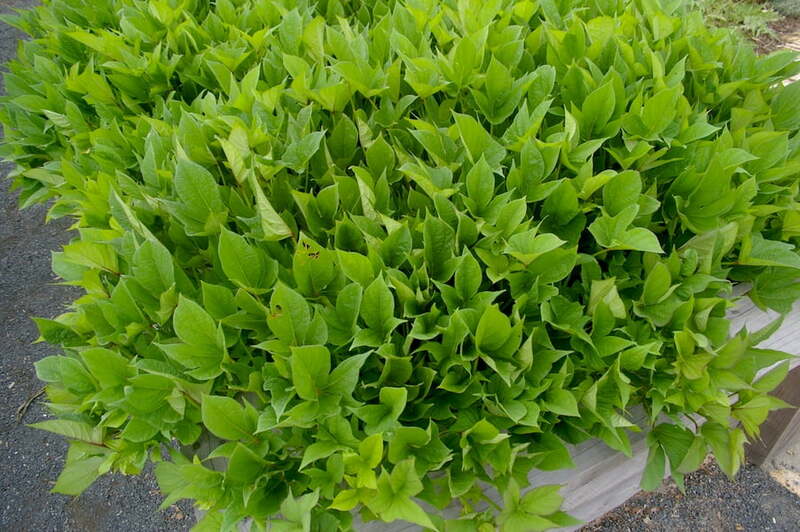 This vigorous climbing plant produces large edible, broad, fleshy leaves. 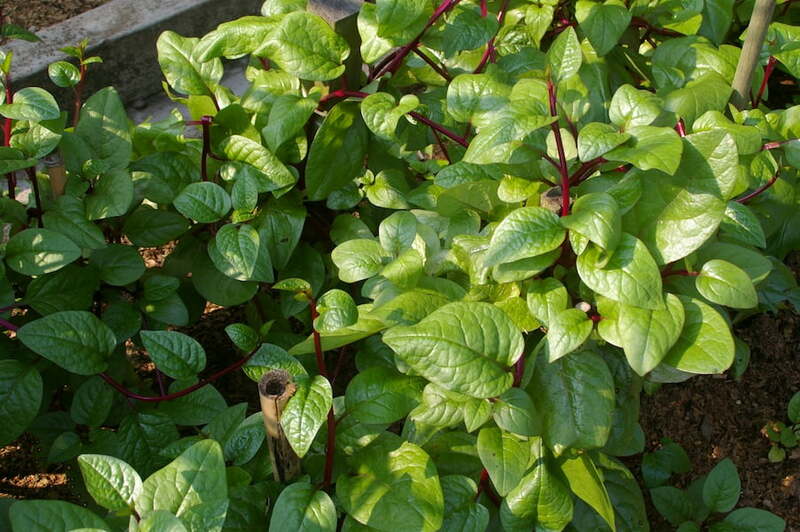 It soon cavers a trellis or frame and one well-grown plant can produce enough spinach to feed a family. There is secret to using the leaves in dishes. Add them after all the other ingredients and cook briefly to maintain the flavor and leaf structure. You can readily overcook the leaves of this plant and end up with green sludge. However many cultures appreciate this glutinous effect and use the leaves to thicken soup or add varied textures to a dish. I find Basella leaves delicious and quite addictive. The juice from the red berries can be used as a natural, crimson food colouring. Two forms of this plant are commonly grown. One has bright green leaves and the other has leaves and stems with a reddish brown cast to them. They both taste the same so it is up to you which one you chose to grow. Basella enjoys moisture and food. If you want a lot of leaves, work lots of organic matter into the soil and then feed and water it well during the growing season. So there you have it – my top 10 subtropical vegetables. If you are not familiar with some of these plants I recommend you give them a go. They can provide you with some reliable, low maintenance vegetables and can form the backbone for your vegetable garden. You will always have vegetables at hand. I’m envious, Arno! Especially of your old tomato plant – I have to grow them as annuals. Do you think any of your suggestions could be grown as annuals in Adelaide? the grass is always greener on the other side! We’re always envious of what you can grow so readily. I love so many Mediterranean vegetables and herbs that are unreliable here. I would love to grow globe artichokes, runner beans, lambs lettuce/corn salad, New Zealand Yams, Brussels sprouts or broad beans, but they don’t seem to thrive here despite numerous trials. The issue is that your summers are hot and dry and your winters cold and wet. Ours are the reverse and many of the plants in my article enjoy a warm moist humid growing season. However it is amazing what people can grow and local knowledge is really important. I would expect cherry tomatoes, Ethiopian cabbage, pumpkins and basella will be fine for you if you keep them well watered. 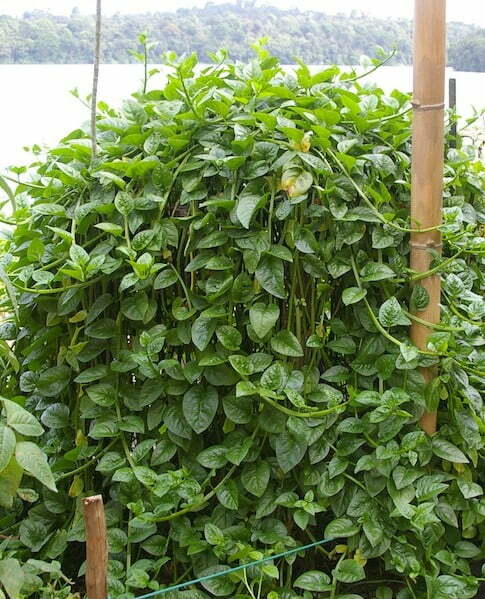 Surinam spinach can be grown in a pot and brought inside or into the greenhouse during the winter months. I know people who grow sweet potatoes in Melbourne and this involves starting them off early inside; planting after frosts have gone (or covering if you are too early); keeping the plants growing strongly during the growing season and ensuring moisture and nutrient needs are met. Its a lot of work. Potatoes are a lot easier for you! I would tend to grow zucchini rather than luffas and grow green beans/runner beans rather than poor man’s bean. These are much better suited to your climate and can be substituted for each other in various dishes..
Chokos may be possible in warm sheltered positions. There are also some cultivars that are much more cold tolerant, so source material locally if you can find it. I would give sweet leaf a miss – unless you have a heated glasshouse. This Borneo native sulks during our winters. It really loves the wettest warmest and most humid months. However the best source of advice is from gardeners in your area. I try to visit local community gardens and open gardens whenever possible, and I belong to the Brisbane Organic Growers Inc (BOGI). I am often surprised what can be grown in my area. Many vegetables I thought were too tropical or temperate for the subtropics seem to grow well here. Often it is a case of learning the ‘quirks’ of the vegetable in this climate or getting local seed which has been selected for local vigour over many generations. It would be great to get feedback on which of my ‘Top 10’ grow well in SA, Tasmania or Victoria. All the best with your veggie endeavours. Thank you, Arno! I’ll let you know! Gosh what a wonderfully informative article. I live North of Cairns but already grow most of what you have talked about (well the ones I have room for). I am very interested in both the sweet leaf and the ethiopian cabbage. Where can I get seeds for these? Great to hear you are growing so many of these plants. Regarding sourcing Sweet Leaf, Limberlost Nursery in Cairns generally stocks and propagates this plant, but I have seen plants for sale at other nurseries and markets in Cairns. The branches are also sold in many markets as a fresh vegetable and you can simply strip and eat the delicious leaves and then plant the stems as cuttings. This plant propagates most readily over the warmer months, but lets face it, if you get a good feed of fresh greens, I would give them a go now. I find with plants like these, once you know what you are looking at you will spot them everywhere. 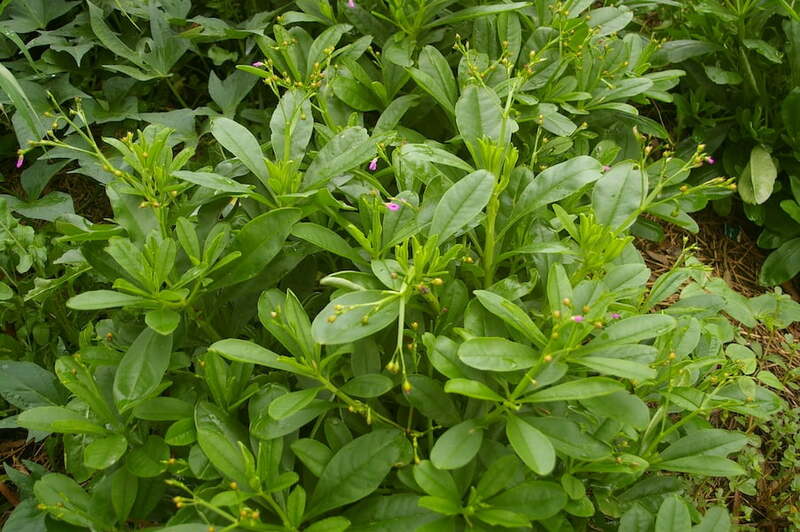 Sweet Leaf is widely grown in your area but is a fairly nondescript plant. I would source seed for the Ethiopian Cabbage from your local organic gardening or permaculture groups or at events or festivals where these groups have stands – this way you will get plants selected for vigour in your local climate. It is also known as Kenyan Cabbage and Woman Meet and Gossip Cabbage (I believe a direct translation of an African name). If you have no success seeds are available from Seedsavers network (http://seedsavers.net). You’ll have to join up, but you will benefit by being able to locate a diversity of seeds direct from growers, networking within like minded people and supporting a great initiative. Good luck sourcing the plants. Hi Arno, I am trying to find out more about talinum triangulara and also talinum paniculatum – I can’t find very much about how to readily separate the two, except perhaps that Triangulara has a triangular stem and paniculatum doesn’t. From what I can find they are both readily edible and highly nutritious – can you shed any further light on this? I suspect that I have talinum paniculatum, have had it for as long as I can remember as a weed in the garden and didn’t know it was anything more than a pretty weed, these days I eat heaps of it as it has self seeded all over my garden here in Brisbane, and have seen it growing as a weed in other gardens in the area. In a nutshell, I would describe Talinium triangulare as a more upright, dense and bushy plant and Talinum paniculatum as a more open, straggly and weedy plant with ornamental flowers and berries on fine open panicles. 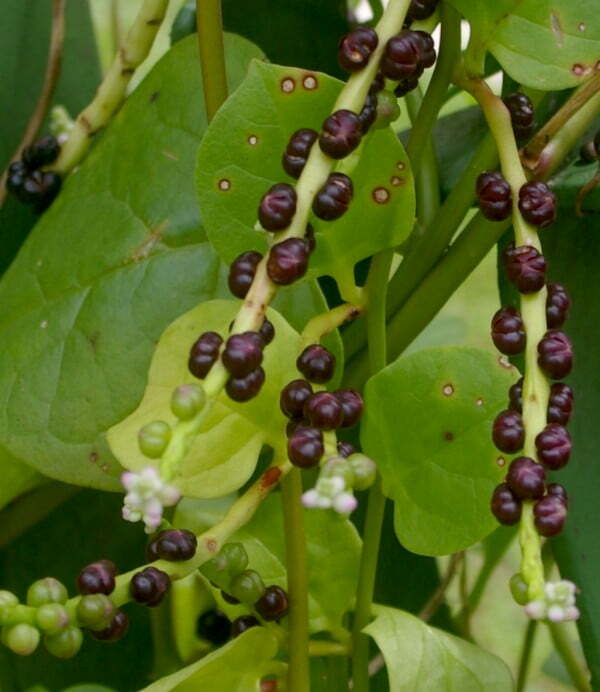 The plant in your garden, Talinum paniculatum has been widely grown as a vegetable for the last 150 years and you will see it being grown by Greek and Italian families in the older suburbs of Brisbane (particularly West End) as a summer green. However it self seeds readily in disturbed areas so I generally do not recommend it for this reason – despite it being a great source of edible leaves. Having said this, it generally hasn’t become a serious weed after all these years and I suspect its success has much to do with the neglected gardens and ageing residents in many inner city areas. There is a variegated version of this plant which I do grow, which is very ornamental, and which is occasionally sold at markets and grown by gardeners. It seems to be less weedy, however I remove the flowers before the berries form just in case. Talinum triangulare doesn’t self seed so readily. I suspect it prefers a warmer wetter climate as occasional seedlings generally appear when we have very wet, warm summers. They appear close to existing plants and therefore don’t seem to be weedy like the plant above. If you wish to grow your T. paniculatum as a vegetable, I would simply transplant specimens to the veggie garden, remove flowers before berries are set and grow your plants in well worked, watered and mineralised soil to enhance their nutrient value. As you have noted, both species are very nutritious, highly productive and very hardy in warm climates – just what we want from a vegetable. Hi Arno – after much research this is the best info I have yet found! Thank you!!!! I would love to grow the variegated version, I will look out for it. I love having something so easy and pretty that is also edible and nutritious. thank you for your posts, they are always wonderfully informative. Thanks once again Arno for your wonderful article…sooo much information and local for us as well. I will have to get George to make some more vege beds for me, you have enthused me to grow more of our own. Its great to hear that my article has inspired you to grow some of these vegetables. As we all know what a fantastic and creative cook you are, I can’t wait to see what dishes you are going to prepare with them. Good article, thank you. I seldom see anyone recommending talinum, which is a shame. It is pretty enough to fit into any shrubbery. You didn’t mention it here, but you have written about chaya before. I’ve looked for that plant for almost 20 years and I’m still no closer to finding one. Do you know anywhere I could find a chaya plant? I’m in Toowoomba so it or a stem cutting will probably have to be posted to me. I realise it is marginal for my climate, but I’ve got protected pockets of garden suitable for it. Any help you can give, pointing me in the right direction would be great. I agree with you, Talinum is a fabulous plant for the veggie garden, but can look great anywhere. I suspect that the reason we don’t see it is that Garden Centres seldom offer perennial vegetables – which is a great shame as I think they should be the backbone of every vegetable garden and should be the main plants grown by people new to vegetable gardening. I was going to include Chaya and left it out simply because of availability. I have given plants to nurseries and keen veggie growers in the hope that it would become more widely grown, but to date this has not occurred. I think many people get nervous when they learn it is poisonous unless cooked. However many other popular vegetables such as potatoes, cassava and rhubarb are also poisonous, so this really shouldn’t be a factor. I will post when I see a source. Hopefully this should be soon. 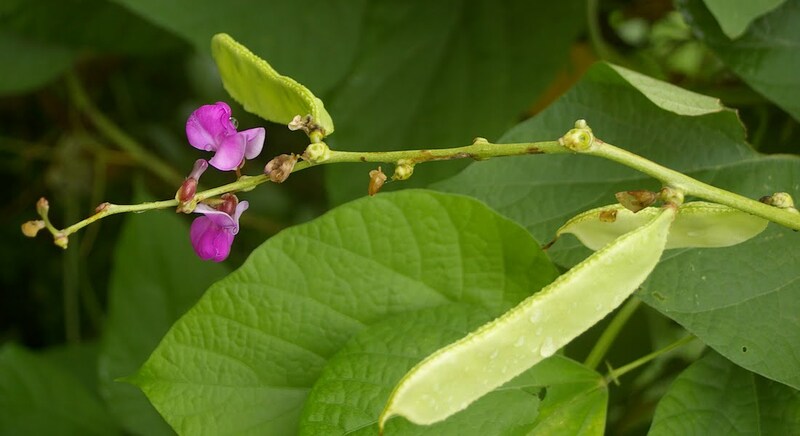 Hi Arno, I am currently looking at seeds I harvested off a plant I bought at the markets under the name of Egyptian Bean, but on googling it, it seems to be a hyacinth bean or Lab Lab bean. I was told when I bought it that it was grown for the dried black beans to be cooked only, but if this is indeed the lab lab bean, I think I would do much better eating the immature beans. It has beautiful flowers and is quite prolific, but how will I know (other than by taste!) if I have an agricultural or culinary variety? The pods are a pale greenish- purple colour. It is very easy to tell the difference between the agricultural (fodder) varieties and edible forms of Poor Mans Bean/Lablab Bean/Hyacinth Bean. Edible have succulent, fibreless beans, whereas the fodder varieties are tough, dry and totally inedible. You can simply snap a pod and identify what you have. As I noted in the article, these beans have a strong beamy flavour. They are not the beans to have with a dab of butter, but are great in stews, soups or curries where the flavour complements other robust flavours. I like to pick them when they are young and tender and before the seeds start to swell. I hope you enjoy your harvest. Growing up, my grandmother, and mother, grew what they called a poor man bean, but it is nothing like the one’s I find mentioned. This bean was purple/green, and was high producer … different taste to normal beans and could take some getting used to if your taste buds were delicate. After my father passed away, mum moved to a unit, which restricted the growing of the beans, and didn’t keep seeds to plant. Any ideas on this bean? From your description of the plant and in particular the bean’s taste, I would say it was a type of lablab bean, as discussed in my article above. There are many different forms or cultivars of this plant and the pods can vary in width and length. The plant I photographed in the article is the form most commonly grown in South East Queensland – along with a white flowered cultivar known locally as ‘Pean’. 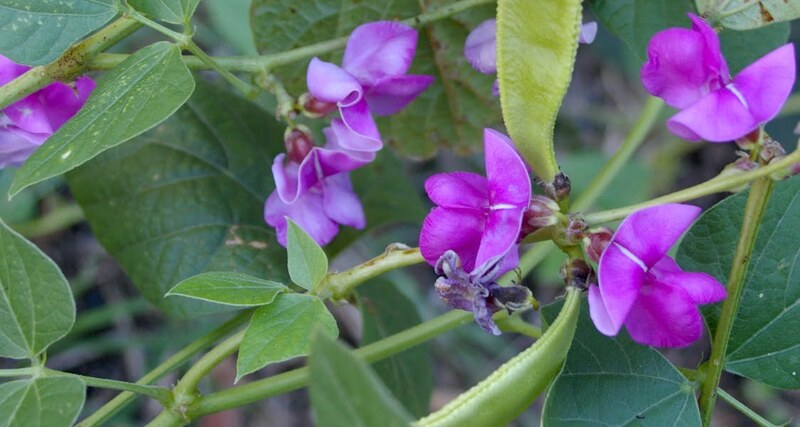 There is also a cultivar with longer, fleshier, purple green pods. It is the one most often grown by Papua New Guinea families. It also has pink flowers and black seeds. Does this sound like your plant? I like the way you describe the taste of the bean. This is what makes me sure it is related to the plant in my article. I always warn people that it is not the bean to steam and serve with a dob of butter. It tastes very ‘beany’ and not delicate at all. However, as you have noted, the plant is extraordinarily productive, and the beans are great in stews. stir fries and curries, particularly when combined with other ingredients that have strong flavours. Unfortunately we have lost many wonderful heritage vegetables over the last 2 decades. Luckily, now that growing vegetables is trendy once again, people are finding some of these old treasures tucked away in gardens and recognising the importance of saving seeds and sharing them around. I hope this is what has happened to the bean you used to grow. 5th Feb. 2016. Hello Arno, my name is Ross Smith, & i live on Bribie Island 4507. Love the way you write plenty, really explain things. At the moment I have a problem with a Jap pumpkin. It’s really gone wild, very healthy looking, It has traveled all the way across the back yard,i stepped it out at about 19 paces, with 2 other runners about 10 paces. The thing is, it’s so healthy & flowers heaps, & i do the thing with my little brush, male to female & they grow a little pumpkin to about golf ball size, & just DIE. this year out of all that vine & flowers i have only had 2 pumpkins. Yes the Jap Pumpkin (technically ‘Kent’ pumpkin) really does well in south east Queensland. A plant just appeared in my garden and grew madly. Before I could pull it up it had pumpkins on it – 40 the first year. I pulled it out but it regrew back from the root 2 years in a row. However each year it was smaller and bore less fruit. As to lack of pumpkins, two of the most common causes here are lack of pollination and too much nitrogenous fertiliser. I suspect the former. I have beehives at my place, but honey bees have been disappearing across Australia, and it appears heavy handed gardeners are often responsible. If you don’t have lots of honey bees buzzing among the flowers, you will have to do the job yourself. Early in the morning, while cool, take a male flower (no fruit at the base) and rub the pollen on the stamens (the ‘fluffy’ bits) onto the stigma (the stalk in the middle of the flower) of the female flower (the ones with fruit attached). Its easy. Note however, on really hot summer days, flowers sometimes naturally abort. If you have been applying lots of fertiliser to the plant – then you are to blame. Many fertilisers are high in nitrogen and this causes the pumpkin to grow lots of dark green leaves and not many fruit. Use a fertiliser where the NPK – the 3 numbers on the packet are roughly the same and the first one isn’t a lot higher the the second two. Many manures are also high in nitrogen. 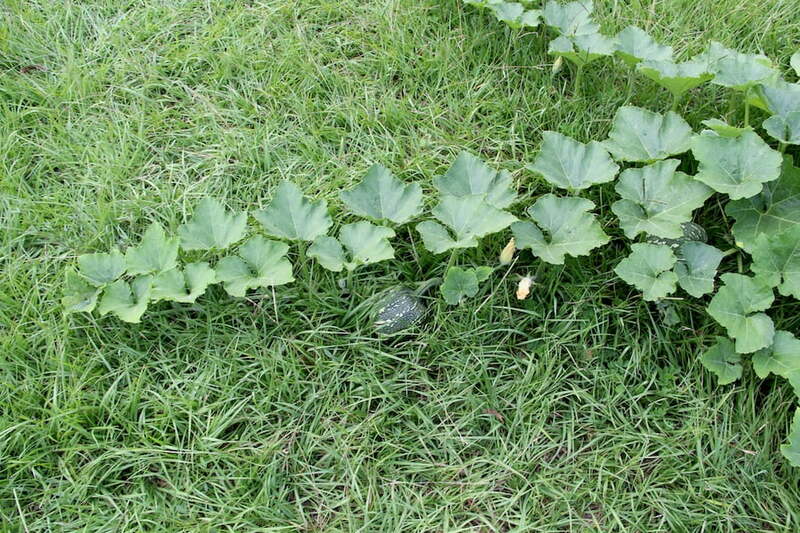 Pumpkins will grow madly if left to themselves. I generally try to relocate the stems weekly and spiral them around the main plant to reduce the overall size. Other growers I know will direct the stems into the centre of the plant. Good luck with your pumpkins. Remember that in Queensland they can act as short lived perennials and if you cut the stems right back, they will reappear next spring. By then you will have perfected your pollination technique. Thanks for your reply Arno, i have done all you said about pollinating, also there seems to be plenty of bees doing the job as well.I think you might be right about the fertiliser, I am not too clued up on that. I also think i have a problem with ph., most of my garden beds (i have metre high beds)(bad back) are around 8 or 9 & don’t know how to reduce it. (Kinda wish i had a list of what needs high or low ph. Anyhow i’ll soldier on & if you can help me any more i’d be happy, thanks Arno. well it looks like we can tick off the pollination issue and instead focus on the soil. However before going on, another possible issue is temperature, and all may be resolved as soon as the temperatures drop a little and the rain arrives. Sometimes pumpkins will refuse to set fruit during warmer weather (fingers crossed). In relation to soil, your pH sounds way to high – we really want 6.5 to 7. The only time I come across pH like this is in limestone country (rare) or when people purchase ‘economical’ soil mixes. Some soil scientists I know have explained that this high pH is a result of some unscrupulous suppliers adding sump waste when composting and hence the soil is high in phosphate, sodium, choride and other salts – and not good for plants at all. Generally we deal with these situations by adding more composted organic matter which acts as a buffering agent as well as humates, humic or fulvic acid. Its hard to guess what might be going on in your soil without a lab test but my experience with these man-made soils (and I’m suspecting thats what you have) is that they are also low in Calcium. This may be the cause of the problems with fruit set. When we have a high pH we add lime (Calcium) in the form of Gypsum – 1 handful per metre square. It may also pay to foliar feed the pumpkin plant using a diluted (1/2 strength) solution and an organic liquid fertiliser with very similar N-P-K ratios (as noted above) as well as trace elements. The high salt levels in the soil may have antagonistic effects on the uptake of other essential minerals. However over time these salts will probably be leached from the soil, the pH will drop and your vegetables will suddenly really take off. Good luck with the pumpkins and let me know if you are successful. I think you could be right about the soil, i was’nt happy with it right from the start, but you go & buy soil expecting it to be good but??? ?.Anyhow my pumpkins are setting, looks like i am going from none to several.As you say maybe too much heat. By the way, i have the same problem with my passion fruit, been flowering for months, & not one has set. Anyhow i am going to go & get myself some Gypsum to try to lower the pH in my soil. Thanks again Arno. I’m glad to hear some pumpkins are setting on your plant. There is still a long season to come so you might get quite a crop. Regarding Gypsum, I realise I didn’t note that it is neutral, so you are using it to add Calcium and not to lower the pH. Organic matter and humates (humid acid) will be the items you will add to help lower your pH. G’Day Arno, I’m still puzzled about my vegie garden. I plant, (mostly seedlings) from my local Mitre 10. Before i do that, i previously cut up & bury almost anything green then later i dig it up to about 15 in.deep, adding horse manure, cow poo (bagged) plus a bit of blood & bone plus some slow release pellets, plus some lucerne mulch, plus a thin layer of new soil, then mix it all in well. Do you think it’s too much, & that’s why my Ph is too high? After i put the seedlings in, they take off for a while, then slow down, & start to look sickly, &some die. Eventually i might get some off them, but not much. I will list what does well & what does’nt. Onions, spring onions, sweet potatoes, paw paw, passion fruit, rocket & lettuce like it. Potatoes, pumpkins (still), Beetroot, snow peas, dwarf beans & peas,carrots, In 3yrs. i have not been able to grow a straight carrot, even sieved the soil to take out any stones or anything. Capsicum, hopeless, cucumber (tiny bugs).They all don’t like it. All those plants may give some indication of ?????? I’m sorry to hear things are still not going too well for you. From the list of plants you gave me, I would say that the issue is the pH being so high. Also it may pay to pull back a little with the fertiliser. You just might be adding a little too much. I would keep doing regular testing of the pH every season. It should start to drop and I suspect your plants will start growing more vigorously as it does. Sometimes its all about patience and perseverance. Also I would keep adding gypsum twice a year at 1/2 a handful per square metre. Make sure you add it at least 3 weeks before you add other fertilisers or manures and water it in well. During this time, focus on the plants you grow well. All the best and I hope you have a great winter crop. I’m concerned about the sweet leaf. You must have heard about the problem with people getting lung problems (and some lung transplants) from having consumed too much of this plant. Have you noticed any problems yourself? yes in the 1990s juice from raw leaves of the plant was promoted as a weight loss diet in Taiwan. A few people went overboard and drank 100-200g (3.5-7 ounces) of juice a day over 2 months as well as eating raw leaves and got bad side effects. Thats a huge amount of leaves to juice! Overdosing on similar fad diets with other vegetables has also had poor outcomes. Lets face it Kale is the fad juicing veg of the moment and it is known to have bad side effects when eaten raw in excess. We just don’t seem to learn. I have recently spent a week in Sabah (North Borneo) and sweet leaf seemed to be the most popular vegetable there, and it was served in many delicious ways. It opened my eyes to the possibilities of this vegetable. However I doubt anyone would have eaten anything like the quantities promoters in these fad juicing diets, even there. Bottom line – enjoy eating sweet leaf. Avoid fad diets and eat a varied diet focussed on garden fresh vegetables! Great post! I am in New Orleans, Louisiana and that “choko” you talk about is what we call a mirliton. You can find all kinds of great recipes for them if you search that way. You often see them grilled with other vegetables as part of a fajita platter. thanks for your response. I didn’t realise mirlitons were so popular in Louisiana. Thanks for the links. I will check out some recipes from your area in readiness for the bumper crop which will be coming in a few months time! I was surprised to see (choko) in your list of veggies. 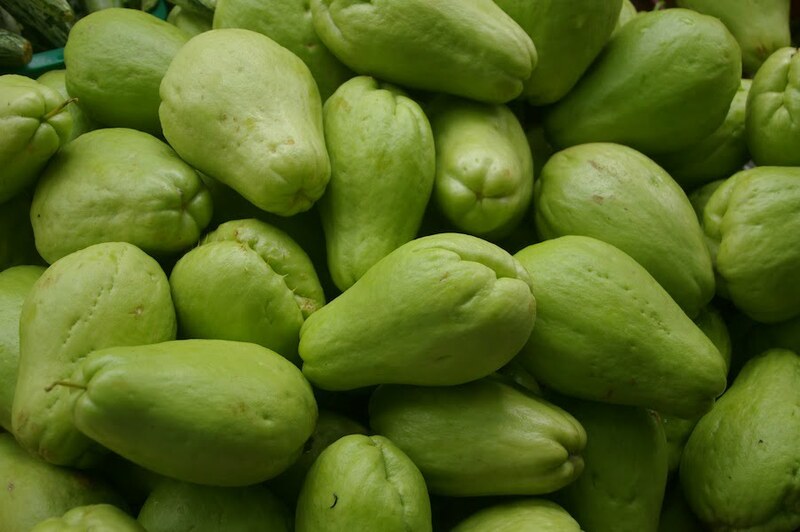 I moved to Panama a little over 4 years and found a vegetable they call (chayote) which appears to be the exact same fruit as your CHOKO. I am a retired pensionado from Indiana, USA. I loved to garden but never ran across it in the US. I love the vegetable and use it in soup and stir fry. Love your blog. I live on Bribie Island Qld 4507. I have tried to grow zucchini the plants look healthy the fruit develops but only grow to about 50ml long then go yellow and drop off. They are planted in a raised garden. I have silver beat, tomatoes, onions and garlic which all grow well. Would appreciate any advice you have to offer. it sounds to me like the flowers aren’t getting pollinated by bees, which is increasingly common these days. You might need to do this yourself. Simply pick a male flower (the ones without the small ‘fruit’ at its base) and go round to the female flowers and dab pollen from the flower onto the stigma of the female flowers. It’s recommended to do this early in the morning. You can do this regularly, or take a break every now and then when you simply have too many fruit! You are great. 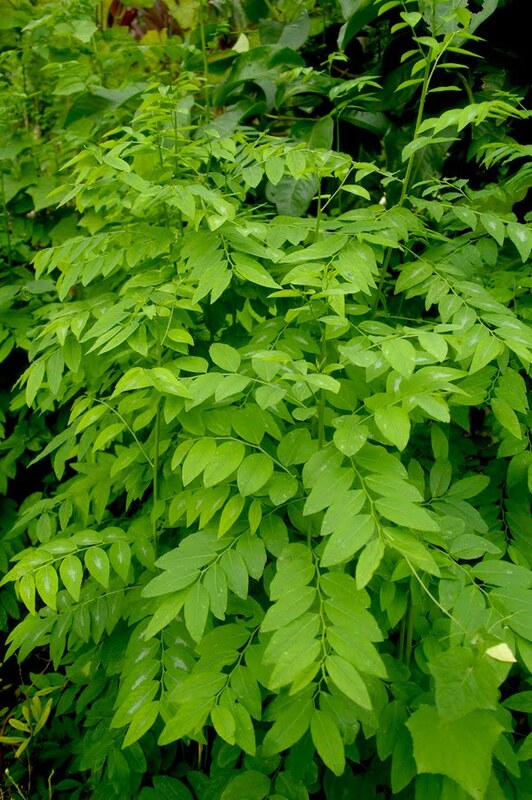 We have all this plant in Loxahatchee for sale, among them others 400 plants like this, including our specialty Moringa Oleifera and Sacha Inchi. Thanks to work hard to educate people about good food. We live in Jimboomba and have had no luck growing pumpkins of any type. They all develop powdery mildew and the fruit never develops. The vines themselves grow to a point and then the plant looses all its leaves. We’ve tried growing them in winter and over summer. This also happens with our zuchinni. Most sites suggest that pumpkins are really easy to grow! What are we doing wrong? Hi Arno, We recently moved into a new build house in a coastal area near Port Macquarie, NSW. I have only a small area of garden available for veggies approx 10m2 which is sheltered on the West side. I am keen to try some of your suggestions e.g. Solanum lycopersicum var. cerasiforme, Sauropus androgynus, Basella alba and Sauropus androgynus. My problem is I am having difficulty in finding where I can get these from.